Lake Village, Jan. 9th, 1860. Dear Old-Line.—Thinking that perhaps amid the din of political strife, a letter from the quiet and secluded little town of Lake Village, would operate as a balm to your weary soul, by again calling to remembrance those scenes of quietude remote from the bustle and confusion of this babbling world, and so seldom experienced in the life of an Editor. I take my pen to jot down a few items of news from this beautiful place to solace you. Know then that Lake Village is a pretty little town, situate on the banks of one of the most beautiful little lakes of the South. 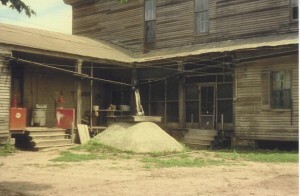 It is the county seat of Chicot county, and is seven miles from the Mississippi river. The surrounding country is one of the most fertile spots in the Mississippi valley, and rivals in richness the far famed Delta of the Nile. The shores of Old River Lake are covered with magnificent plantations which are cultivated with great care, and the yield of cotton is almost fabulous. The health of this country is reasonably good. The town is small but improving very fast. This appears to be one of the places where Lawyers “most do congregate” as there are a great many of them here, but as for the other learned professions, they are thinly represented. The public buildings are all excellent, and especially the Jail, which is undoubtedly the best in the State—these public buildings are sure evidences of enterprise and public spirit. The towns and surrounding country are very much in need of mechanics, and a good saddler, shoemaker, or tailor, could do better here than almost any where else, provided however, that he be a sober and industrious man. Mechanics of other trades also can find plenty of work at high wages and ready pay. I know of no place where mechanics can do better than here. There will be a newspaper published here in a few weeks, which I take to be another proof of the prosperity and enterprise of the country. Dr. Lyon has been here “feeling the public pulse,” for his prospects for Congress from this district. He made a speech at the Court House the other night and defined his position to his audience. He says that he is not an Old-Line Democrat—is in favor of re-opening the African slave trade, &c., &c.
The political atmosphere is quiescent at present, in fact the people are too busily engaged in their own private affairs to attend much to politics. Your valuable paper has various subscribers here, and is very well liked. Your moderate, yet firm course is entitled to the respect of all thinking men. A project is on foot here to establish a Female College at Lake Village, with an endowment of $50,000, a considerable of which is now subscribed, and the day is not far distant, I trust, when Lake Village will be the site of one of the most magnificent and interesting female colleges in the South. This place is one of the most beautiful and healthy in the world, and is of easy access, no school of like character is near, and it is due the enterprise of old Chicot that she should have one first class school within her limits. The Chicot levy board are pushing on their works with great rapidity, and seem determined that the Mississippi shall never again visit the plantations of Chicot county. The levys are built far back from the river, and are very large and substantial. There has been some very cold weather for this country here this winter and no little know, but the weather is now warm and rainy. The Post Office at Luna will soon be changed back to Columbia again, from whence it was removed to Luna last fall. The planters have got their cotton crop nearly gathered, and a fine one it was too. The planters of this county appear to have fine success in growing cotton, and their plantations are models of neatness and good farming. I’ve added a Lakeport Plantation Fan Page to Facebook and started a Twitter account for Lakeport. If you aren’t familiar with these 21st century social networking tools, you probably aren’t alone–but your demographic is getting smaller every second (my Mom is now my Facebook friend). As social networking exploreds, it is becoming an important part of the marketing landscape. I believe it’s important to bring our antebellum plantation home, beautifully restored by Arkansas State University, into the 21 century. The large hole in the large cistern has been patched! 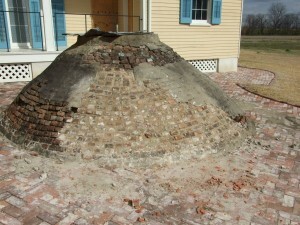 The large cistern, which sits along the ell porch, had a large hole in its side for many years; a photo from ca. 1956 shows the cistern intact. up to deliver goods to the commissary, which was in use as late as 1984.
the house and collected water for domestic use. Rain water was captured by the built-in/box gutters on the second story of the house and half-round gutters found along the ell porch. 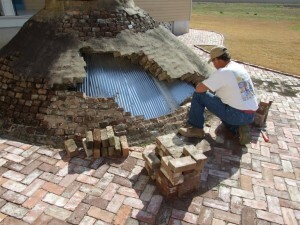 The water was then directed by downspouts into brick collection boxes in the brick walkway. The water was strained and then flowed into underground troughs that originally fed into the cisterns. Today, rainwater is directed into several collection boxes in the yard and the cisterns have been filled with sand for safety. Uses for the water in the cisterns would have included washing, cooking, cleaning, and drinking. A local carpenter, Keith Carpenter (his real name), decided to use sheet metal as the form–though not what would have been used in the 19th century, it does the job using the same principle. Once the form was in place, Lester Davidson, a mason who has worked at Lakeport before, was able to patch the hole using bricks left over from the restoration and a mortar created from lime putty and local river sand. Click on the slideshow below to see more pictures of the work on the cistern and shots of the guttering system as well. 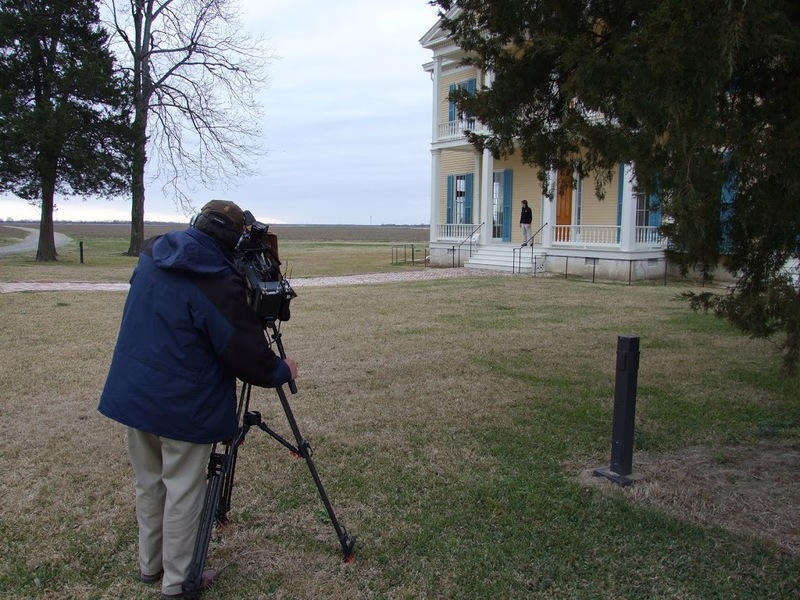 Exporing Arkansas, a National Geographicesque program on The Arkansas Educational Televsion Network, featured Lakeport Plantation last week. Program host Chuck Dovish visted Lakeport during a cold spell in mid-January. The program aired twice (March 2 and 8), but you can still see the ~6 minute segment on YouTube. 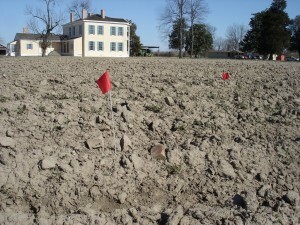 During the week of February 16 to 20, archeologists from the Arkansas Archeological Survey and the Lakeport Restoration Team members flocked to Lakeport to try to answer burning historical questions about the antebellum layout of the plantation. Skip Stewart-Abernathy, a survey archeologist stationed at the Winthrop Rockefeller Institute atop Mt. Petit Jean, led the project. Dr. Stewart-Abernathy, who first visited Lakeport in 1984, specializes in historic archeology. Lycurgus Johnson constructed Lakeport ca. 1859, just at the end of the antebellum period. Lycurgus built his house just north of Joel Johnson’s house—his father. 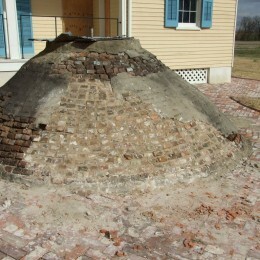 Joel Johnson arrived at that location in 1831 with 23 slaves. By 1860, Lycurgus, after consolidating his father’s holdings with his own. had over 4,000 acres of land and 155 slaves. An antebellum cotton plantation like the Johnson’s is typically centralized with enslaved labor (i.e. slaves) occupying the “quarters” and the master occupying the “Big House.” The master employed an overseer who supervised gangs of labor who worked to grow and then pick cotton. A post-Civil War plantation looks a lot different. Land ownership usually didn’t change (as was the case with Lakeport), but labor arrangements to grow cotton did change dramatically. Now free, the labor that once grew and picked cotton in gang labor transitioned into family units of tenant farmers and sharecroppers. These families, in a contract with the owner, farmed and lived on smaller sections of land. 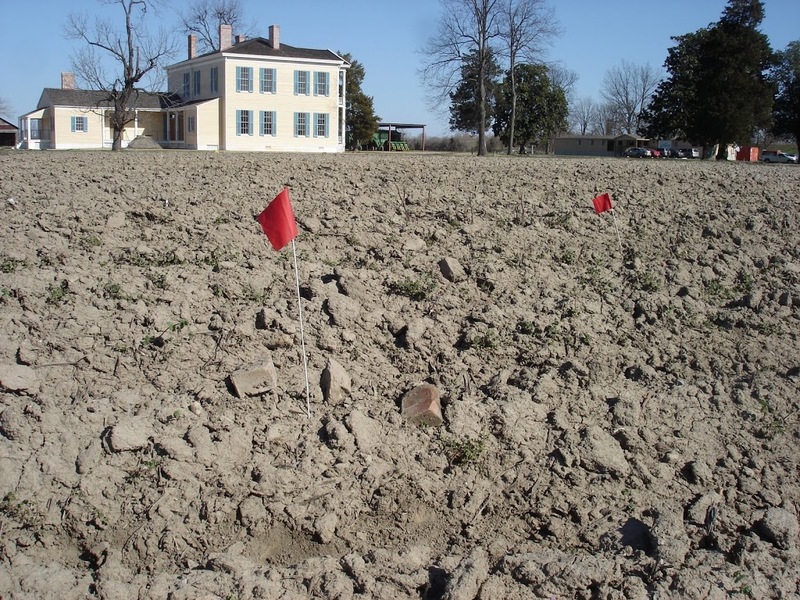 This week of archeology is part of the on-going research at Lakeport Plantation and helps fulfill the mission of interpreting the people and cultures that shaped plantation life in the Mississippi River Delta during the Antebellum, Civil War, and Reconstruction periods. We’re open Monday thru Friday with tours at 10am and 2pm. Visit our website for directions.